A relentless and fierce competitor in any sport she endeavors to master, Gerda Hofstatter Gregerson made her biggest mark on the green sward, and earned immortality as a result. In the late 1980s, professional player and trick shot artist Mike Massey was demonstrating straight pool to a small group of students at a billiards camp in Sweden. After a run of roughly 150 balls, Massey pocketed the break ball then watched as the cue ball caromed into the rack and barely made a dent in the balls. One of the students did — a young female from Austria named Gerda Hofstatter Gregerson. She spotted a two-rail kick shot and pointed it out to the entertainer. Massey gave it a try, pocketing the object ball and proceeding to pocket 218 more balls – still to this day his highest run. The Austrian used that sharp eye and competitive spirit to spend almost a decade as one of the top players on the Women’s Professional Billiards Association’s Classic tour, racking up 10 professional titles in an eight-year span. 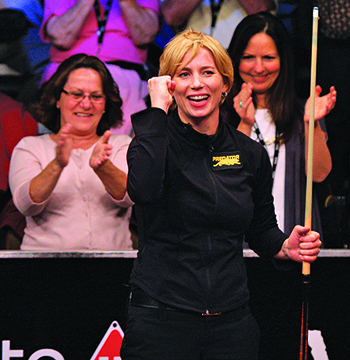 Hofstatter Gregerson was rewarded for her consistent and prolific career in August when she was voted into the Billiards Congress of America Hall of Fame. It’s been a busy year of accepting accolades for the Charlotte resident, who also was inducted into the WPBA Hall of Fame in January. While growing up in Althofen in the Austrian state of Corinthia, Hofstatter Gregerson spent her formative years playing tennis, skiing and fencing — winning Austrian and international junior championships in the latter. When she was 15 years old, her sister Ingrid was part of a group of townspeople who acquired a pocket billiards table and started a local league team. Hofstatter Gregerson was immediately hooked and started competing locally in league events. Although she remained committed to fencing, her interest in billiards was building. In an indirect way, both Hofstatter Gregerson and the billiards community owe a debt of gratitude to her fencing coach, who demanded that she choose between the two activities. She chose pool. “I was just absolutely fascinated,” Hofstatter Gregerson said. One person early on who wasn’t so fascinated with Hofstetter’s newest interest was her father, who didn’t like the idea of his daughter being in facilities where smoking and drinking were prevalent. For months, Hofstatter Gregerson had to sneak around in her hometown to practice and compete until her father eventually warmed to the idea after seeing her abilities. “In the end, he became my biggest fan,” she said. Hofstatter Gregerson is back where she is most comfortable: In competition. With her fencing sword packed away, Hofstatter Gregerson had a cue in her hands whenever she had time — hopping on her moped after school and heading to the club room for practice. She played in her sister’s weekend league and eventually caught the eye of the area organizers who encouraged her to compete in tournaments. After she won her first Austrian title, Hofstatter Gregerson traveled 20 hours by train to Sweden for the European Championships, earning a medal. When she called home after the tournament and her parents asked how she performed, Hofstatter Gregerson made a proclaimation. “I didn’t win, but I will next year,” she said. The following year, Hofstatter Gregerson won Austria’s first gold medal. Originally nicknamed “The Swashbuckler” in Europe due to her sword fighting abilities before acquiring the “G-force” nickname in the United States, Hofstatter Gregerson moved to Sweden in 1990 at age 19 to train with Sandman. She spent hours working on drills that he had developed and taught students at that summer camp she attended with Mike Massey. Hofstatter Gregerson had five practice drills that she recalled from the camp which she religiously worked, doing five repetitions of each and keeping track of her daily performance like a body builder working out. When she did face competition, they weren’t shooting often, with Hofstatter Gregerson winning the Austrian national championship 17 times and the European title 10 times in her career. “It doesn’t matter if it’s the World Championship or we are just goofing around, she wants to win,” said longtime friend and fellow BCA Hall of Famer Ewa Laurance. Through her numerous European tournaments, Hofstatter Gregerson occasionally rubbed elbows with WPBA professionals like Laurance. She began talking to Sandman about competing in the United States — the only country at that time where a female could truly earn a living playing pool. He contacted the Swedish star, asking if she would sponsor his student for a few months so that Hofstatter Gregerson could practice and compete in the U.S. Hofstatter Gregerson stayed with Laurance in Michigan, with the two practicing and traveling together. The young Austrian would occasionally babysit Laurance’s daughter, Nikki, when mom was booked for exhibitions. Because she was reigning European champion, Hofstatter Gregerson had an invitation to compete at the 1993 San Francisco Classic — the inaugural event of the WPBA Classic Tour. Although she was a highly decorated European player, she still considered herself an outsider and simply tried to maintain focus and enjoy the experience while simultaneously being in awe of her opponents. Her competitive spirit and sharp eye overcame any intimidation she was feeling and the young Austrian won the title. She immediately called her parents back home after the championship match. “Mom, you won’t believe this. I won. I’m rich,” she said. 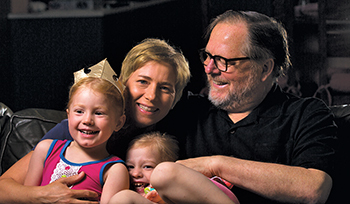 Gerda and husband Dan spend much of their time doting on daughters Sophie and Madison. Hofstatter Gregerson spent the next few years dividing her time between Europe and the U.S., before moving to the U.S. full-time in the late 1990s, setting up a residency in New York City. Women’s pool legend Jean Balukas sponsored her and provided a practice facility at her family’s Brooklyn room, Hall of Fame Billiards. Hofstatter Gregerson remained one of the top players on the tour — winning at least one event each year from 1993 to 1997. 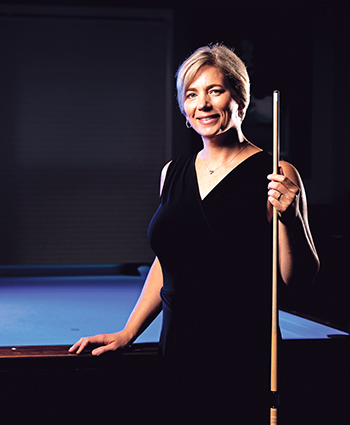 One of her biggest victories came at the 1995 WPA World 9-Ball Championship, when she used a combination shot to defeat Vivian Villarreal in a hill-hill title match. After a winless 1998, Hofstatter Gregerson took home the Rochester Classic and the BCA Open 9-Ball Championship the following year. After a decade-long dry spell, Hofstatter Gregerson again retuned to the winner’s circle at the 2010 San Diego Classic. Hofstatter Gregerson also encouraged other European women like Fisher to cross the ocean to compete. A number of players followed in her footsteps in the same way that she followed Laurance’s. When she ran into her old counterpart Thornfeldt at an event ,she encouraged her to give the women’s tour a try. “She was the first to pave the way for us,” Thornfeldt said. “I don’t think the women’s game would have grown without the players from other countries coming over and challenging us,” said Hall of Famer Loree Jon Hasson. Ever the student, Hofstatter has constantly developed her mind and pursued interests away from pool. When she moved to Sweden for training as a teen, she bypassed an opportunity to attend college, a void that gnawed at her. Eventually, she found herself at New York University’s open house one day and enrolled — earning a bachelor’s degree in business. Many times, she would step off a plane following a tournament and head straight to a night class. “I never missed a class when I was in New York,” she said. “She’s a very smart girl. She’s always educating herself,” Fisher said. Hofstatter Gregerson stopped competing in 2013, trading her cue for a spouse and two daughters. But as she prepares for her entry into the Hall of Fame, the pool flame still flickers. She’s begun practicing recently and plans to enter upcoming WPBA events. The knowledge and poise are still there, and the competitior in her believes she could put her game back together. “I feel like I could still compete,” Hofstatter Gregerson said.